I'm very proud to present you my latest roulette system - IRS3 - the Impeccable Roulette system and the name implies for what it is. I had it completely simulated and automated by a very reliable programmer, who was stunned by the system's performance and he said that it was simply amazing and unbelievable. He also said, that this is a system, that he would chose to use to make consistent profits in roulette. The tests were performed against all 15,000 spins of the Zumma tester book for Roulette, which is for double zero and the result was a stunning +6,483 units. This is like making 1 unit every 2-3 spins, which is quite incredible for a negative expectancy game having a 5.26% house advantage. The system is completely parametric, that is, you can enter various different values for highest bet, system bankroll, etc, and observe the results on a chart and end profit at the end of the 15,000 spins. 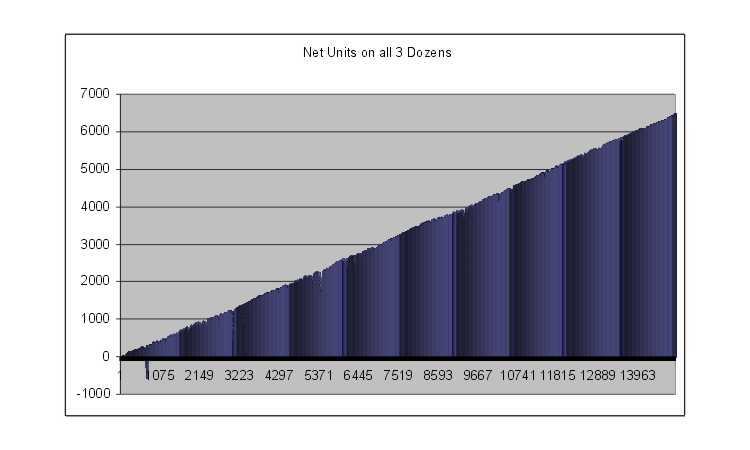 The above result of +6483 units was achieved with a bankroll of exactly 1,392 units and highest bet of 465 units. With those parameters, the system won every single run, without losing one. This is ideal for tables with betting ranges of 1-500. Then the system is totally invincible. If your table limits are lower, such as 1-300 or 1-200, the system still profits quite a lot, but some runs will have to be abandoned with a certain accepted loss. 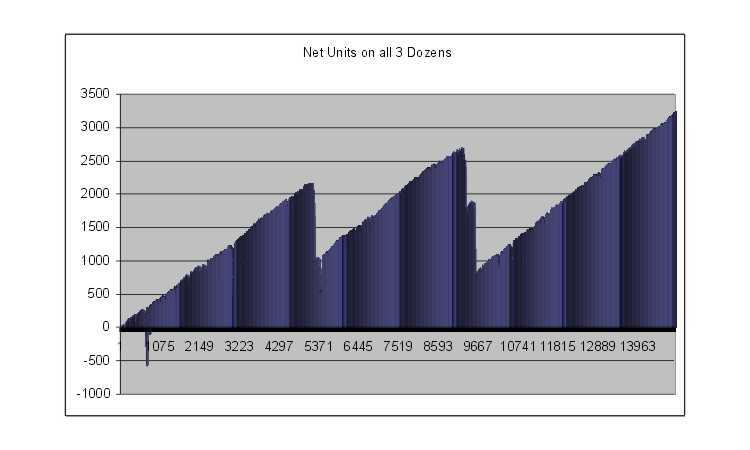 For a maximum bet of 300 units, the system profits +3238 units for 15,000 spins. For a maximum bet of 200 units, the system profits +2074 units for 15,000 spins, etc. You will enter those parameters in the attached simulation and you will see for yourselves. Since the system is totally automated, there is absolutely no need for manual testing. Since the system is totally programmable, then it is surely a totally mechanical system, that is, two people applying the system will have identical results following the rules of the system to the word, provided they use the same bet limits. IRS3 is designed for Roulette only, as it bets on Dozens and/or Columns, paying 2 to 1 or 3 for 1. It bets on all 3 dozens either simultaneously or at different times with differential betting option. It surely does not bet on the dozens that do not come up. I have seen dozens sleeping for up to 36 spins on some tables. During this sleep time, the other 2 dozens are the ones performing the best. Imagine your profits, when the system detects two out of three dozens falling asleep and one of them triumphing bet after bet. The system will tell you exactly when to stop betting on a specific dozen and when to resume your bets on it. In fact, even those options are parameters within the system's simulation and you can experiment further with them to find even more profitable options and values, although the computer was utilized to its utmost to find the parameters, which maximizes your profits. The system may look a bit complex at first, but with study and practice you will get a good feel of it and you will enjoy its performance. A perfectly rising graph, with no losses. The end profit is at: +6483. Dozen 1 generates +2113 units, Dozen 2 generates: +2161 units and Dozen 3 generates: +2209 units. All three dozens are deployed in the system. One simply triples the profits of playing on all three dozens, rather than playing only one. You can bring a partner who can apply the same system on the columns, as well, and make the same amount. If you get very well with the system, you may manage to deploy the columns as well on your own, thus making up to 13,000 units within 15,000 spins, almost a unit per bet - simply incredible, isn't it? We can detect not more than 3 abandoned runs throughout the entire 15,000 spins, averaging 1 unit profit every 5 spins. The charts show you your net balance at all times, at the end of each spin, not at the end of the completed run. The lowest maximum bet you can have and still be profitable with the system is 167 units. The high bets occur only on very rare occasions, though. A most typical tough run will not require more than 40 units for a maximum bet. The system is priced at $90 and is very low compared to the profits you will make every time you use it. It has not more than 17 pages in the system document, which has lots of examples for you to understand the system thoroughly. The simulation shows every single spin of the 15,000 Zumma tester book and provides you with all the information you need to master IRS3. And as always, you have a full money back guarantee upon your full satisfaction of the system. If not, you can ask for a full refund within 30 days of your purchase, no strings attached and no questions asked. Click here to order for an email delivery of the system. It will be one of your best investments ever. For only $5 extra, you can have a printout mailed to your address.